The 2017 Annual National VOAD Conference is underway in Houston, Texas, as this is written. ARRL is a NVOAD member organization, and ARRL Emergency Preparedness Manager Mike Corey, KI1U, is currently representing the League in Houston. Watch for conference summaries and news. NVOAD is an association of organizations that mitigate and alleviate the impact of disasters, provides a forum promoting cooperation, communication, coordination and collaboration; and fosters more effective delivery of services to communities affected by disaster. Since its founding in 1970, National VOAD Member organizations have worked tirelessly to assist communities affected by disasters and have grown to more than 100. Among many presentations, Director of Individual Assistance Chris Smith, W4HMV, provided the FEMA update at the conference this week in Houston. The theme of the conference is "Bridging the Gulf." The venerable Hamvention®, at the new location -- Greene County Fairgrounds -- in Xenia, Ohio, is this week -- Friday, May 19, through Sunday, May 21. This year, Hamvention is the ARRL Ohio State Convention. Here is a guide for public event/emergency/disaster response communicators planning on attending. First, check out the ARRL Expo, a must for any conventioneer. ARRL will have a huge presence at Hamvention and welcomes all. ARRL Expo features a large store of ARRL pubs and other items, and a fantastic array of exhibits. Download the ARRL Expo Exhibit and Activities Guide. Meet ARRL leadership and key staff including ARRL Emergency Preparedness Manager Mike Corey, KI1U, who is responsible for proposing, developing and administering ARRL emergency preparedness, emergency and disaster response initiatives and related programs at the national HQ level. To be held on Saturday afternoon at 1:45 to 3:00 in Room 4, the Public Service Communications Panel Discussion is simply not to be missed. With a panel of experts and pioneers in their respective nationally recognized programs and organizations, moderated by ARRL Emergency Preparedness Manager Mike Corey, KI1U, you'll have a chance to listen and ask questions involving contemporary, critical public service communications issues with these leaders. Panelists include Rob Macedo, KD1CY, VOIP WX Net and VOIP Hurricane Net; Paul English, WD8DBY, US Army MARS; David Stapchuk, KD9DXM, US Air Force MARS; Bobby Graves, KB5HAV, Hurricane Watch Net; Bill Feist, WB8BZH, SATERN; and Ross Merlin, WA2WDT, Department of Homeland Security, SHAred RESources (SHARES). Next, enmesh yourself in the Mesh Networks presence - on-the-air, forum, booth, and mini-classes. This technology takes advantage of the amateur microwave bands and the bandwidth that goes with them, for ultra high speed data and applications. Hams are now building radio-based high speed digital mesh networks low cost commercial hardware adapted for Amateur Radio use. Mesh provides flexible, high speed wireless communications that can be adapted to varying terrain types, can be rapidly deployed, are fun to build and use, and are particularly well suited to the emergency/disaster response needs of many served agencies. The Miami Valley Mesh Alliance (MVMA) has joined with the Amateur Radio Emergency Data Network (AREDN) core technical team to provide the Mesh Network presence at Hamvention. On the air, the local Mesh network will be found on Channel -2 at 10 MHz bandwidth. The SSID is AREDN-10-v3. At the Mesh Networks Forum (Saturday at 1:30 PM in Forum Room 2), AREDN's Andre Hansen, K6AH, will discuss AREDN capabilities, deployment and applications. Reps from MVMA and the AREDN Core Team will host visitors at their Booth #1001, located in the extreme southwest corner of Building 1. · See booth for class schedule details. SHARES - Interoperable HF Emergency Communications: Friday, 9:15 to 10:15, Room 2. Ross Merlin, WA2WDT, SHARES Program Manager, will moderate a forum on SHARES (SHAred RESources), a Federal government HF radio program for backup communications and interoperability among Federal agencies and Federally-affiliated entities that have a need to send or receive national security or emergency preparedness communications such as state agencies, county emergency management agencies, and critical infrastructure/key resources providers (telecommunications, energy, healthcare, transportation, etc.). This session will include both an introduction to SHARES for potential users and an open forum for audience members to discuss program issues with the SHARES Program Office staff. Merlin wrote the National Interoperability Field Operations Guide (NIFOG), which is widely used by public safety and emergency communications professionals across the country. Also in Room 2, directly following the SHARES program, is the MARS forum, moderated by Paul English, WD8DBY. The Military Auxiliary Radio System (MARS) is a Department of Defense (DOD) sponsored program implemented by the Army and the Air Force that trains amateur operators to provide contingency High Frequency (HF) communications support for DOD. MARS volunteers are trained on unique military messaging formats and use Military Standard digital protocols as well as digital encryption on DOD assigned HF frequencies. This forum will feature presentations from both the Army and Air Force MARS program leaders and may include other technical presentations relevant to this unique DOD support mission. This forum is open to all MARS members as well as amateurs who are interested in supporting the MARS mission. Presentations will be given by Paul English, WD8DBY, Army MARS Program Manager, and Dave Stapchuk, KD9DXM, Chief Air Force MARS. The APRS Forum will be held in Room 1 from 10:45 to 11:45, moderated by APRS inventor/developer Bob Bruninga, WB4APR. APRS continues to expand into more areas. Bruninga will give an update on the state of APRS and the opportunities for APRS via the several amateur satellites now including worldwide coverage via three geostationary birds receivable with a SDR dongle and Raspberry pi kit. At 1:15, in Room 1, John Peterson of the US Department of Homeland Security (DHS) -- Office of Emergency Communications (OEC) will discuss communications training and issues DHS- OEC forum, which will be of interest to auxiliary emergency communicators who volunteer to provide backup communications support for public safety and emergency response agencies. Typically they are Amateur Radio communicators from groups such as MARS, ARES, RACES, SATERN and others. They are routinely used by event planners and emergency managers at all levels of government. Today nearly all the States/territories have incorporated some level of participation by amateur auxiliary communication operators into their communications interoperability plans. Talk with the DHS Communications Unit (COMU) subject matter experts and learn about the nationally recognized NIMS/ICS compliant AUXCOMM workshop and with senior level emergency communications experts who have incorporated this training in recent national level disasters. This forum will also include discussion of the AUXCOMM course and the AUXCOMM Field Operations Guide (AUXFOG); information on OEC's Interoperable Communications Technical Assistance Program; how amateurs are incorporated into the National Emergency Communications Plan (NECP); information on how you can become qualified to teach the OEC AUXCOMM course for your state; the latest changes expected for Communications Unit (COMU) training, which includes Communications Leader (COML), Communications Technician (COMT), instructor courses for COML/COMT, AUXCOMM, Incident Communications Manager, Incident Tactical Dispatcher and the RADO courses. At 1:30 in Room 2, Brandon Peloquin, Warning Coordination Meteorologist, National Weather Service of Wilmington, Ohio, will present the NWS Forum. Topic: Working With Amateur Radio To Save Lives During Severe Weather. NOAA's Weather-Ready Nation initiative is about building community resilience in the face of increasing vulnerability to extreme weather and water events. To achieve this, the National Weather Service (NWS) strives to develop and strengthen partnerships with those who contribute to this initiative. This presentation will describe the partnership between Amateur Radio operators and the NWS and how they work together to help communities be better prepared for severe weather. On Saturday, at 9:15 in Room 3, moderator Bill Feist, WB8BZH, will discuss SATERN in The 21st Century: The National SATERN Committee will discuss the new Strategic Plan for SATERN approved by The Salvation Army in 2016. This will include a discussion of the goals SATERN is setting for itself over the next several years and the results of the SWOT (Strengths, Weaknesses, Opportunities, Threats) Analysis upon which those goals are based. Special Achievement winner S. Ram Mohan, VU2MYH, will discuss disaster systems and deployments in Asia. Ram Mohan is the Executive Vice Chairman and Director, National Institute of Amateur Radio, Hyderabad, India. As Chief Investigator for the Indian government's Department of Information Technology, he implemented programs for digital connectivity to urban/rural/remote areas through Amateur Radio, studied propagation in coastal areas and developed an advanced digital Amateur Radio communication network. He led team members on numerous disaster deployments including the Nepal Earthquake 2015, Cyclone Hud 2014, Uttarakhand Floods 2013, West Bengal 'Ayla' Cyclone 2009, Indian Ocean Tsunami 2004, Gujarat earthquake 2001, and the Orissa Super Cyclone 1999. Attend this forum at 10:30 in Room 3, on Sunday morning. Harrisburg, Pennsylvania -- Springtime allows us to shake the winter hibernation and service the radio shack to ensure all systems are good to go. If you are a MARS operator, that also includes gleaning the latest updates on Military Auxiliary Radio System (MARS) operations. U.S. Army and U.S. Air Force MARS operators from Region 3, composed of the states of Delaware, Maryland, Pennsylvania, Virginia, West Virginia, and the District of Columbia, gathered for the Region 3, Army MARS annual conference April 6-8, 2017. The event was hosted by the Pennsylvania Army MARS staff in cooperation with the Pennsylvania Emergency Management Agency (PEMA). As MARS nears 100 years of service to the country, the jam packed conference showcased the dramatic evolution of resources available to support today's volunteer MARS operator to meet the mission of providing contingency and emergency communications for the Department of Defense (DOD) and federal and civil authorities. The conference was opened by Travis Best, the U.S. Army MARS Pennsylvania State Director, and partners from PEMA, the facility host. Travis shared the outstanding relationship and trust developed between PEMA and the Pennsylvania MARS operators. This has allowed MARS to establish a state of the art Amateur Radio operating station in cooperation with the PEMA Auxiliary Communication Services (ACS) inside the PEMA Commonwealth Response Coordination Center (CRCC). Following, the U.S. Army MARS, Region 3 Director, provided a very interesting keynote briefing on the state of MARS membership in Region 3, which has remained reasonably steady over the last three years. The group was joined on the first day via video teleconference by the U.S. Army MARS Program Manager Paul English, WD8DBY, who praised the continued service and dedication of the region MARS membership, and provided news and updates from Army MARS HQ and the U.S. Army NETCOM Command, which is Army MARS' higher command. The conference was highlighted by the educational presentations on the latest Army MARS operating tools and software packages. Across the region, operators dedicate thousands of volunteer man-hours annually to the mission of supporting our nation, the Department of Defense, and the armed services with two contingency emergency communication support systems designed to operate in a cyber denied or impaired environment. Membership is critical to MARS success. Losing members, especially those that have become close friends and like family over the years, is tough. During the conference, attendees shared a solemn and reverent moment by Rendering Bell Honors in memory of the six region members that became silent keys (SK) over the past year. The conference was full of lighter moments as the attendees shared in various social activities to include the Saturday evening group dinner. The fairly new PEMA facility was an accommodating facility for this event and PEMA has already graciously extended an invitation for the region membership to return for next year's conference planned for April 6-8, 2018. On May 1-3, 2017, the Suquamish tribe hosted the 14th Annual Regional Joint Tribal Emergency Preparedness Conference at their Port Madison Indian Reservation overlooking dxÊ·sÉqÌÊ·Éb ("place of the clear salt water" in the Southern Lushootseed language) at Agate Pass in Puget Sound, Washington. Radio amateurs from Washington, Oregon, California, and Arizona all contributed to the success of this conference. The Kitsap County (Washington) ARES/RACES/ACS group set up a radio station and display tables in the wide hallway outside the conference rooms, and many tribal emergency management leaders stopped by for information, to chat about creating a stronger Amateur Radio presence within their tribes, and to watch the station in operation. Mike Montfort, KBØSVF, Kitsap County EC, termed his group's participation as "a fantastic opportunity" to build relationships with his neighbors. At the request of Chris Morganroth IV, KI7EGI, Quileute Nation Fire Chief, Montfort, along with Dan Ransom, K7MM, will soon be conducting a Technician license class for Quileute tribal members. On Monday, two hams gave talks at the conference general session. Suzanne Everson, KI7EGE, Regional Emergency Management Specialist at Region 10 Administration for Children and Families, co-presented "Administration for Children and Families, How We Can Work With You." Lou Schmitz, KE7RYR, American Indian Health Commission, presented "Emergency Preparedness Toolkit." On Tuesday morning, three hams gave talks at the conference general session. Jim Sande, KG7NRF, National Tribal Emergency Management Education Sub-Committee Chair, co-presented "Pursuing ongoing Education in Emergency Management." Nathan Nixon, N7NAN, President of the National Tribal Amateur Radio Association and Training Coordinator for the Inter-Tribal Council of Arizona, spoke about the "Indian Country Intelligence Network." Tracy Depew, KI7EGC, Director of Emergency Management, Cow Creek Band of Umpqua Tribe of Indians, presented "FEMA HMA External Stakeholder Working Group and PDM in Indian Country." On Tuesday afternoon, three hams gave talks during the breakout sessions. Bart Kus, AE7SJ, founder and lead developer of HamWAN, spoke about the operational high speed digital network designed for maximum resiliency and survivability, which operates on amateur service microwave frequencies and allows for continuous exchange of data between key emergency management facilities throughout the Puget Sound region. Steve Aberle, WA7PTM, Assistant. State RACES Officer, gave a talk titled "ESF #2 (Communications) Support for ESF #6 (Mass Care) and ESF #8 (Public Health)," which included a practicum in message receiving for the participants. Adam Geisler, KJ6YHN, Regional Tribal Government Liaison, FirstNet, co-hosted "First Net Presentation, Listening Session and FirstNet Surveys." On Wednesday morning, Suzanne Everson, KI7EGE, gave a breakout session talk titled "Children and Youth Task Forces," and Lynda Zambrano, KE7RWG, Executive Director of the Northwest Tribal Emergency Management Council (NWTEMC), facilitated an open panel discussion between attendees and the NWTEMC Board of Directors. Lynda reported that many of the participants in the conference had made "best tribal emergency preparedness conference ever" comments to her. When activating a demonstration station at these conferences, the question that always comes up is "what was your furthest contact?" Up until shortly before being asked, the answer would have been "Florida." However, after being asked, Dan, K7MM, tuned to 20-meter CW and heard some European DX coming in fairly strong. But, none of the hams at the conference had a straight key or a bug with them. Monte Simpson, AF7PQ, ARRL Western Washington Section Manager, commented that he had once seen a Coast Guard radio operator use a pie tin with a short piece of metal as a makeshift key. Dan, K7MM, then plugged an unterminated cable into the key jack on the radio and connected one lead to his knife and one to his wedding ring. He then used his free hand to tap his wedding ring against the knife, and the "wedding ring CW key" was born. With this, and to the amazement of all, Dan managed to make a QSO with RU3XL in Belgorod, Russia. This excellent example of improvising very much impressed the tribal leaders. ARRL Sacramento Valley Section News, April 29, 2017 -- ARRL Sacramento Valley Section Emergency Coordinator Greg Kruckewitt, KG6SJT, has been instrumental in the development of flmsg HTML custom templates of Red Cross disaster forms. These templates used with flmsg optimize disaster messaging communications over data circuits by removing form variable data, i.e., the message itself, from the overall form. Saved to a small object file, the message can then be moved efficiently over an HF, VHF, or UHF data circuit. 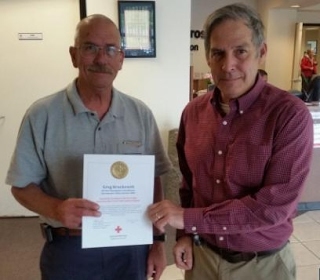 In recognition of your outstanding contributions for your many hours of effort developing Red Cross disaster forms templates suitable for transmission over digital radio circuits. Your contributions reflect highly on the Red Cross mission and on the partnership between the American Red Cross and the American Radio Relay League. Jim Pepper, W9PX, was recently appointed as the new Illinois State RACES Officer and AUXCOMM Coordinator by Illinois Emergency Management Agency Director James Joseph. After working as a chemist after college, Pepper went to work in the two-way radio industry in 1981. In 1988, he started a career with the Illinois State Police Communications Bureau, where he currently serves as the Radio Network Manager for the northern third of Illinois. In this position, he is the de facto COML for the Illinois State Police. He holds both General Radiotelephone and Second Class Radiotelegraph licenses, as well as APCO and NABER certifications. He was part of the original Starcom design team, when it began as simply a replacement for the State Police Low Band radio system. Pepper is a state-recognized COML and COML Instructor, as well as AUXCOMM Instructor, and earned his Illinois Professional Emergency Manager (IPEM) recognition in 2012. Pepper has served in numerous public service posts: firefighter/paramedic for the Rock Falls Fire Department, adjunct professor in the Electronics Department, Sauk Valley Community College, and Division Commander in the US Coast Guard Auxiliary. He has served as District Chairman and Council Board Member with the Boy Scouts of America. I hope to work many of you on Field Day next month. Along with Team K1CE member Eliot Mayer, W1MJ, longtime friend and Field Day fanatic, we will be operating on emergency power all weekend, from the Three Rivers (Suwannee river, Santa Fe river and Ichetucknee river) area in rural northern Florida. Look for us on the ARRL Field Day locator! Have a great Field Day, one of the best major operating events that can simulate field conditions in a disaster area. It's also just plain fun!